Eid ul fitr 2011 marks the end of the holy month of Ramadan. In Islam, there are two major festivities and these are called The ‘Eidain’ meaning the two eids. Eid in Arabic means something or some event that recurs or comes back at regular intervals. The two eids are eid ul fitr and eid ul adha. 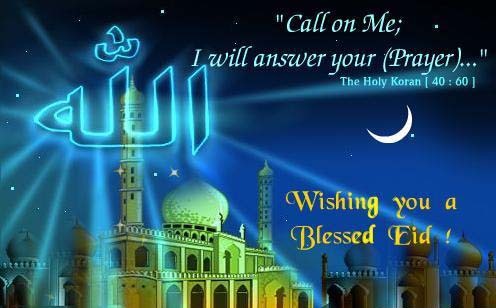 Eid ul fitr 2011 marks the end of the holy month of Ramadan, which is the eight month of the Islamic calendar characterized by fasting. In the month of Ramadan,Muslims all over the world abstain from eating, drinking, conjugal relations from dawn to dusk. This is the external manifestation of this spiritual act of fasting. However, as with all acts of worship there is a deeper inner dimension as well. This involves the cleansing of the heart and mind from evil thoughts and purging the tongue and the limbs from the inclination towards vain talk, gossip, back-biting etc and guarding the senses from indulging in the Forbidden, looking at the Forbidden, listening to the Forbidden,touching the Forbidden or walking towards the Forbidden. The month of Ramadan is marked by increased acts of charity, of prayer, of devotion, of remembrance of God and acts of humanitarian assistance and strengthening familial bonds. The Muslims as a community, are involved in a month long rigorous exercise in patience in restraining their desires in self sacrifice, in devout worship and in magnanimous acts of easing the sufferings of human kind. All of this constitutes a sustained spiritual and physical exercise in helping them to become better human beings and more obedient creatures of the All Mighty. 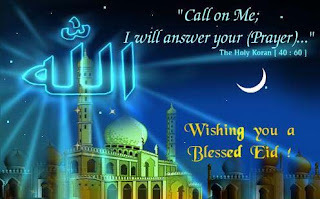 At the end of this month long fasting with the sighting of the new moon begins Eid Ul Fitr 2011. This is a unique celebration in that it is a form of thanksgiving to the Creator for giving them the opportunity of spiritual cleansing and of sharing the blessings they enjoy with the less fortunate ones. As Allah says in the Holy Quran Ch 2 V 185 ‘Allah wishes for you ease and does not wish for you hardship and that you may fulfil the prescribed period and that you proclaim the greatness of Allah that He guided you and so that you may be grateful’. The eid day is marked by charity which precedes the congregational prayer and the logical reasoning behind this is to enable the less fortunate ones to participate in the joys of eid. It has been narrated in a Hadith that on this day the Angels descend and meet the believers at every street corner and give them glad tidings of the acceptance of their fast, their prayers, and their charity and of their deliverance from the hellfire. In conclusion, the Eid Ul Fitr distinguishes itself from standard celebrations in that it is an exercise in spiritual upliftment and humanitarian acts of kindness and magnanimity.